Laminated Glass is processed mainly in three period. 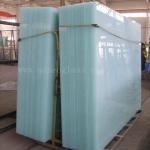 First of all, Pre-Laminating two sheets or more sheets of glass with PVB or SGP; Then Cooking Pre-Laminated Glass on Autoclave with Pressure about 13 PA and High Temperature around 135; the last step is Packing.If it is Tempered Laminated Glass, certainly the glass should be toughened firstly before pre-laminating. The Tempered Glass conbining to Laminated Glass can be processed with Polished Edges,Holes, Cut-Outs or in Irregular Shape. Laminated glass can be used as Curtain Wall, Door & Window, Roof, Balcony,Balustrade,Partition, Step,Table, Cabinet, Wardrobe,Sliding Door,wherever you would like to use. Further information about Qingdao Neo Glass, please feel free to contact with us now! Interlayer Color: Clear, Extra Clear, White Translucent/Opal/Milky, Grey, Bronze, F-Green, Blue etc. Package: Plywood End Cap, Plywood Crate, Metal End Cap, Naked Package for A Fame,Carton Package, Pallet Etc.